Sunflowers originally came from the U.S.
Sunflowers are the state flower for Kansas. Sunflowers are a great choice for planting to attract birds to your yard. There are two kinds of sunflower seeds. Oil is made from black seeds and snacks are made from striped seeds. Sunflower seeds are also used to feed birds. Sunflower seeds are rich in oil, which they store as a source of energy and food. Sunflower seeds are crushed to give us oil. We can use sunflower oil for cooking. There is only one flower on each sunflower stem. The sunflower is native to North America and was used by the Indians for food and oil. Some farmers use it to feed their livestock. We use sunflower seeds to make oil, bird seed and for snacking. They have lots of calcium and 11 other important minerals. They do have 50% fat, BUT it is mostly polyunsaturated linoleic acid. The Netherlands grew the tallest sunflower at 25' 5.5" tall in 1986 by M. Heijmf. Sunflower seeds are also used to feed birds. The former Soviet Union grows the most sunflowers. The sunflower is the national flower of Russia. 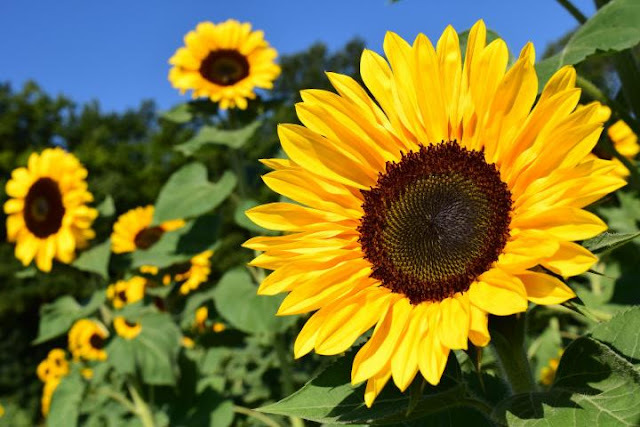 A well-known sunflower characteristic is that the flowering heads track the sun's movement, a phenomenon known as heliotropism. It require only 90 to 100 days from planting to maturity. The daily orientation of the flower to the sun is a direct result of differential growth of the stem. A plant-growth regulator, or auxin, accumulates on the shaded side of a plant when conditions of unequal light prevail. Because of this accumulation, the darker side grows faster than the sunlit side. Thus, the stem bends toward the sun. There are more than sixty different kinds of sunflowers in the U.S.